BRANDON, MB – A professor at Brandon University (BU) is working with researchers around the globe, exploring some of the most important stars in our sky with the Hubble Space Telescope. 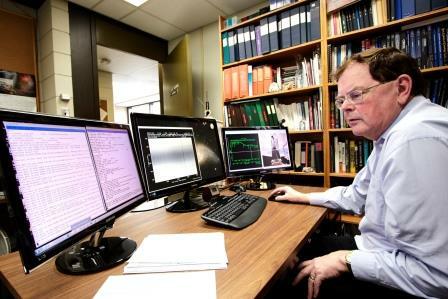 Dr. Gulliver is the lone Canadian among 30 researchers from the US, France, Germany, Belgium, Italy, Turkey, and New Zealand using the Hubble to observe ‘hot stars’, which are 10,000 to 100,000 degrees compared to our sun at 6,000 degrees. Hubble’s orbit above the Earth’s atmosphere allows it to take extremely high-resolution images without atmospheric distortions, giving researchers a deep view into space and time. Hubble observations have led to breakthroughs in astrophysics, such as accurately determining the rate of expansion of the universe. While the project will last several months, Dr. Gulliver is anxious to observe Vega, the second most important star in astronomy after our own sun. Vega has been used for more than a century to calibrate astronomical measurement systems. Dr. Gulliver was part of a research team in the 1990s that discovered Vega was a hot star rotating at such an extreme speed that it bulges around the equator. “Understanding other stars helps us to better understand our Sun and the world we live in,” he says. “Outstanding researchers, such as Dr. Gulliver, are forging the future of Brandon University as well as bringing the latest knowledge and research to the fingertips of our students,” says Dr. Andrew Egan, Dean of the Faculty of Science.